Enjoying a brilliant weekend of warm spring weather, racing on a well prepared and watered circuit, round two of the Judd Racing British Premier Cup hit Little Silver MP last weekend. In the official British Clubman championship it was Ashley Greedy who stole the show bagging four wins in the combined MX1/2 races. Had it not been for a puncture picked up early on in his other race, a clean sweep loomed. As it was, not even a fifteenth place finish stopped him topping the MX1 pile. 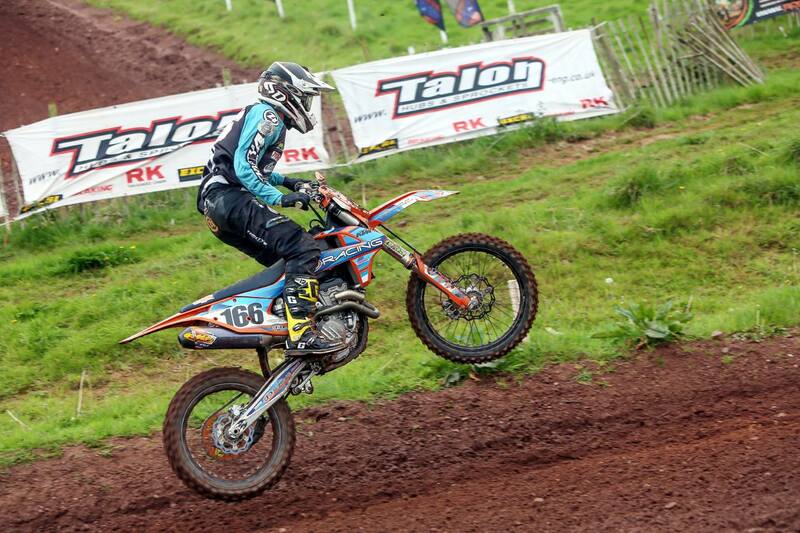 In MX2, series leader Jack Bas suffering a broken wrist early on in the proceedings – it was Sion Talbot who dominated winning four times on his way to overall glory. Ending up with a 2-4-2-3-2 race card Josh Taylor was the runner up in MX1, he retained his series lead as unlucky Joe Clayton had to settle for podium third. After going 3-2-3-1 in his first four heats, and with him then holding second place in heat five, Clayton had the MX1 overall win in the bag. Two laps from home however, a tumble down the hillside changed all that. Connor Halligan’s spirited efforts going 5-3-2-2-2 claimed second overall for him in MX2 together with the new championship lead. Finishing third overall in MX2, Tony Cadman did well just to overcome some mechanical issues which threatened to derail his weekend. Doubling up in two classes, and having nothing worse than a fourth place finish on his card, TM two stroke star Jim Davis only just missed out on the podium in MX1. In the Adult 125’s his courageous efforts paid much better dividends as four out of five race wins put him on the top step. Generally racing in the Davies wake, Jasper Uphill battled hard and impressively weekend long. One race win and four seconds rewarded him with the section runner up prize as a solid weekend of third and fourth place returns saw Aaron Ongley take podium third. In the Junior 125’s another great show from Drew Anderson swept the board clean as Callum Beeken narrowly edged out Thomas Andrew for second overall. For the second meeting running Anderson was highly impressive as he also made fourth overall in the combined Expert result. A five race devastating blitz coming from wild card entrant Jed Etchells took all the plaudits in the 250f youth rookies. Series leader Josh Greedy fended off Harry Pritchard for the podium runner up spot – both Greedy and Pritchard along with Kieran Yorke impressed with second place finishes – they just didn’t have the fire power to trouble Etchells. 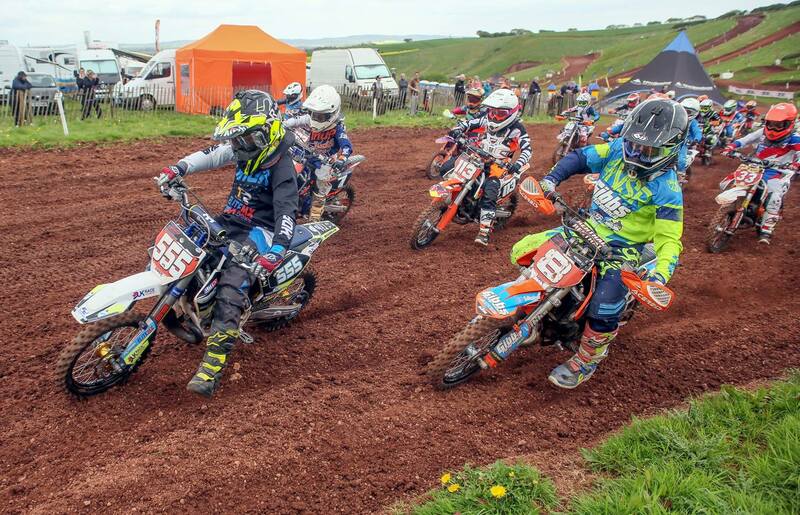 Jack Wankling scooped fourth overall in the banger class with a solid determined show as Danny Clarke topped out in the combined 125cc rookies. There were two 125cc race wins each for Clarke and runner up Preston Williams as Liam Gale triumphed with the other heat win. A cracking third place finish in his final outing handed Billy Wilson podium bronze just ahead of Gale. Claiming three heat wins in the best National performance of his career, Billy Carter was over joyed and jubilant carrying off the overall victory in the b/w 85’s. Harvey James and Lee Percy claimed the other heat wins as weekend consistency put Ben Clark and Jason Down on the box in second and third overall respectively. In the s/w 85’s Judd Racing pilot Bailey Johnston was a class act. Four heat wins and a second meant he topped the podium and extend his series lead – Jaygo Beasty snapped up the other race win. In heat five Callum Murfitt would claim his second runner up finish of the meeting, that sealed podium second for him, beating off a good fight coming from James Barker. Going into the event Judd Racing hot shot Ollie Colmer was the series leader in the Junior 65’s. He hit another four terrific heat wins, unfortunately a mechanical breakdown in his other ride dropped him back to fifth overall and series second. Colmer’s misfortune produced a knife edge finish as McKenzie Marshall, Louis Vincent, Harrison Greenough and Henry Life ended up with just four points covering them at the top. Vincent was the other race victor but in the battle for podium supremacy Marshall’s second place finish in heat five proved crucial. Vincent ended the meeting as runner up just one point short of Marshall’s total with Greenough and Life tied on points for podium third. With a superior finish in race five Greenough took the overall third place prize as Marshall claimed the series lead. In the 50cc Auto’s, Jayden Jones and Hayden Statt took home their respective overall winners spoils. Series leader Jones was a three times race winner in the under 8’s division as Statt won once in the under 7’s section. Claiming the other two heat wins in the under 8’s Zane Stephens kept Jones honest weekend long to score second overall as Ben Casey claimed a well fought third overall. In the under 7’s, race wins also went to Harley Smith (twice), eventual runner up Archie Britton, and Elvis Totney. Briton, a new recruit to the Judd Racing stable, also retained his series lead as Riley Loftus beat off Elvis Totney for third overall. Words and photos by Mike Gurney.